Here are some very important things you need to know before you do that. The thing with selling or transitioning your business, is that you must, at all costs, explore and look at the fine details or else it could be extremely expensive tax wise. First, you’ve got to consider if are you incorporated? I know it’s a no brainer and most likely many of you out there have a corp., but if you are not incorporated, well now you’re selling something that is going to be completely taxed in the year that you are doing it. So, if you’re not incorporated and you’re selling this for a significant sum around $50,000, $100,00 or higher, then you should certainly consider incorporating your business and implementing that strategy ahead of time. Now hypothetically, assume you’re incorporated, and you are selling a bunch of different things. You could sell the shares of the company, sell the assets and/or sell the inventory. There’s a whole bunch of different ways you could structure this. Now, these get a little bit complicated but let me present to you the nuts and bolts of it. Let’s assume that you are selling the actual shares of your operating company. Let’s call it a Canadian operating company. You want to sell the shares. I would ask you why would you want to sell the shares? For most people, selling the shares will allow you to access Canada’s small business capital gains exemption. It’s over $800,000 for all Canadians right now provided that you’re a participant in the business. There are some tax tests to make sure that you do meet the test for participation. We’re not going to cover that today, but let’s assume you do in this situation. That can be a whole chunk of money that comes into your pocket outside of the corporation tax rate. Now the buyer needs to be willing to buy your shares and not the asset. That would be a big advantage for you. You can benefit from the tax of the small business capital gains exemption, but you also have to remember that there are some rules with respect to cash and passive assets. The important factor is the cash inside of your business. You should absolutely make sure that the year you’re selling your business, you have either consulted with a Portfolio Manager or your accountant to make absolutely sure that you meet this test. The worst thing on earth would be for you to sell this business, assume you’re getting the exemption and then you don’t get it. The cash test is an important one. Generally speaking, it’s in the current year that you need to have less than a percentage of cash and you also need to be able to go back three years. The cash test is a big one and you need to make sure you do meet that test. Second of all, if you’re selling the actual assets, you’re not selling the shares. Now, we got to figure out how much of that is going to be taxable. What is the cost based on all of those assets and how much of that is going to be taxable? The key for that is you will want your average cost base or your ACB to basically be as high as possible. You’re going to get into a situation where there’s going to be some more taxes to pay in that case, but depending on how you’ve structured the business, depending on how much cost base you’re able to add to that and depending on some of the creative work you’re able to do on the accounting side, you might be able to reduce your taxes a bit. Once you have these dollars, you’ll want to have the portfolio structured in a tax efficient manner in order to receive the dollars that get sold out either into your personal name or into the corporate name. 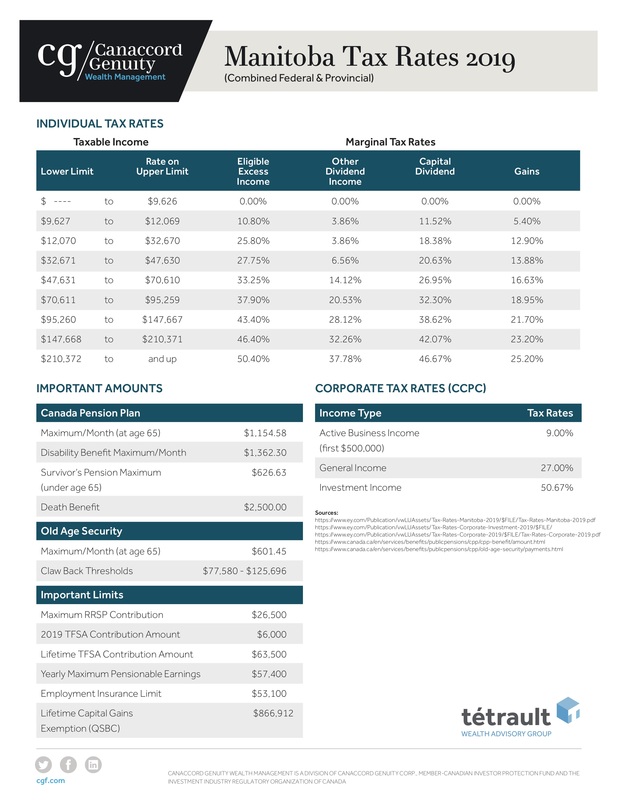 You’re either going to want to have a significantly tax efficient portfolio personally or in the corporation, and that’s the kind of stuff we do here at Tetrault Wealth Advisory Group – Canaccord Genuity Wealth Management. How do we do that you may be asking yourself? We focus on dividends. A dividend tax credit is huge for business owners. We focus on RoC or Return of Capital. That’s usually done through a REiT (Real Estate Investment Trust) or Alternate Investments like that. On the fixed income side, you can get some pref. shares. They also end up paying dividends. It’s classified for the dividend tax credit as well, so the focus has to be tax efficiency once you sold the business and make sure to consider all those factors before you sell it because, once you sold it, it’s too late. Please consult with a Tax Specialist for further information and to help you determine if these strategies are suitable to you. If you want to book a call or schedule a meeting with Rob to discuss your investment portfolio, just click the button below and we’d be happy to help. Video: Efficient Charitable Giving & Contributions. Do you donate? Are you a philanthropist? Do you want to contribute to the charity of your choice in a more tax efficient manner? Are you concerned about leaving some money at some point to a charity after you’ve passed on and you also want to leave as much as possible to your kids? We’re covering a few important tips about donating money today. Obviously, these strategies are best suited if you’re making significant donations, but even if you’re donating 5 or 10 thousand dollars, these strategies can absolutely be used to benefit YOU personally in a much more tax efficient manner. Generally, this is how it works; you want to donate some money to your favorite charity foundation. You’ll pull out your checkbook, write a check. Then the charity gets the money and the because you donated, you will get a tax credit also knows as a donation credit. You get roughly half of the money given back. I am rounding numbers to keep it simple. You get roughly half of that back on income tax depending on the province you live in. Now a much better way to do it and what we like to emphasize is if you want to donate shares in kind, you avoid the capital gains on the shares that you’ve donated. In addition, you get the full tax credit for the actual amount given. Let’s go through an example. You take a share of a publicly traded security that you own in your personal portfolio and then you donate that in kind through a transfer of securities. That share you will avoid the capital gains on it. The capital gains tax is generally about 25 percent of any and all gains, so if you donate the portion of your portfolio that’s got the most gains, you could be donating for twenty five cents on the dollar. We do it all the time. You want to structure a portion of your portfolio, if your intent is to be giving or contributing to charity foundation either on an annual basis, every five years, every 10 years and/or in your will & estate plan. What you want to do is set up an investment vehicle that has a diminishing ACB (adjusted cost basis) and an average cost base that goes down annually. The perfect example for this would be a REIT (Real Estate Investment Trust.) It could be a publicly traded REIT or a private REIT. They pay out income. They reduce your ACB, so if you have a $10 share today and you get 8% tax efficient income, your ACB goes down to $9.20. If you do this for a few years. Next thing you know here, your ACB is at zero. When your ACB is at zero, you then flip it around, donate that share to the charity, the foundation or the organization of your choice. Essentially, your total cost to donate a full dollar to your charity will only cost you $0.25. You avoid the capital gains tax and you get the full tax credit on the way out. Voilà! Your charity is excited and pumped! You’re excited because you’re able to donate way more than you could before and now everyone is happy with the outcome. There is also another way you could do it. You could look at some tax planning strategies through insurance to then leave some money to the charitable cause of your choice through legacy giving. These kinds of strategies are very efficient. Some of them are simple and easy to implement, but there’s a good chance that nobody has ever told you about this. Hopefully you put that to good use. If you’d like to schedule a call with me and discuss further on charitable giving or anything related to your portfolio management, just click the button below and I’d be happy to help. Video: What Are The Financial Ramifications Of Getting Divorced? What Are The Financial Ramifications Of Getting Divorced? Today, we’re elaborating on divorces and the financial ramifications of going through one. If you happen to be going through one or you think you might be going through a divorce, you might find some valuable information here. -Your accountant and your lawyer. Hopefully, you have one of those professionals in your network that can help and guide you through the painful process of a divorce. There’s a ton of marital assets that are there. First and foremost, you will want to divide the marital assets. This is going to be one of the steps that’s going to be very complicated. One other key point you need to consider is factoring in the tax implications of dividing those marital assets. Sometimes you’re much better to have a real asset like a property or a home (the marital home) than it would be to potentially own a registered asset, like an RRSP or something similar. These are factors that you definitely have to consider. When you’re going through the split, there will often be pensions involved and you’re going to have to consider all of these pensions that come into play in the divorce. How much of each do you have access to? Do you have access to the future cashflow? Are you doing a NPV (Net Present Value) on those pensions in order to figure out what they’re worth today? At the end of the day, there will be a ledger indicating the assets for husband, the assets for wife and then there will be an equalization payment. It’s complicated, trust me. Have the RESPs been factored in? Is that being taken care of? Who’s going to be the trustee for the RESPs and how are you going to function that on a go forward basis, especially if the kids are still a young age. You also must consider and ask yourself this; what does my retirement look like? The retirement for a couple is significantly different than retirement for a divorcée. So the divorcée now needs to factor in less cash flow. Expenses will most likely be similar for a house, for a condo, for travelling expenses, etc. Your cashflow is now way less than it potentially was before. Our priority at Tetrault Wealth Advisory Group is to make sure we can generate that cashflow. We do it in the most tax efficient way possible. You certainly want to make sure you look at all the documentation, the insurance needs, the beneficiary change. You’ll want to look at the liabilities, look at any joint bank accounts with your name on it. There’s unfortunately a laundry list of things that you need to go through and some of this stuff can easily be forgotten. The worst case scenario is that you forget one of these factors and the next thing you know, you’re jointly held liable for something with your ex-spouse. This is not an idea situation. Tons of things to consider if you happen to be going through a divorce. We covered a lot of stuff here today folks. If you’d like to schedule a call with Rob to discuss further on your current investment portfolio management, just click the button below and we’d be happy to help. Video: Should You Invest With A Robo Advisor? When we provide advice to clients, it is important to understand your tax rate so that we can provide you with the best personalized guidance. This information can help us determine whether your contributions should go into your TFSA (Tax Free Savings Account) or your RRSP (Registered Retirement Savings Plan) during your earning years. Alternatively, we will consider how we can maximize your current tax bracket in retirement by drawing down your assets in the most efficient manner. How does your CPP (Canadian Pension Plan) / OAS (Old Age Security) amounts factor into your retirement cash flow needs? How can you avoid or minimize the effect of OAS claw back? When should you start taking your CPP and how will it affect your income needs over time? Through our comprehensive planning process we address these questions and more. As always, reach out to us with any questions. We are here to help.